At night my parents would go to the dinners and the entertainment that were provided for by AGA and we would head on down to Baytowne Wharf for dinner and fun! No one get to leave without pictures on the porch... not even the parentals... don't they look cute! jackson and brylee nightly porch picture! they wanted another picture on the BIG chair! Monday Night this is where we ate Cabos! It was really good! It also had a playground... always a plus!!!!! 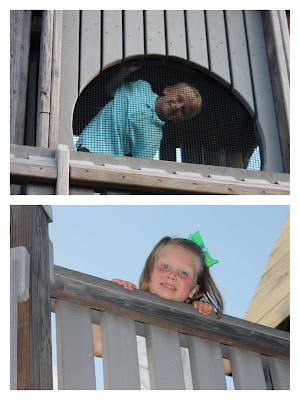 having fun on the playground! This little guy was good too. watching the kids play, and eating! I had to take a picture of this... how fun! People would rent golf carts or owners had their own and they would ride them to Baytowne at night... they had golf cart parking (no car parking)... it was cool! They also had fun driving these little boats they had. Jackson was too serious for a picture! But not brylee... all smiles while she is driving! and we split a hot fudge sundae! It was another fun night!